Two weeks ago we saw the release of a great new .io game: Moomoo.io. Well, it seems that game might be creating a new style of .io game. The creator of Limax.io and Oib.io has just released his latest addition to the io games genre, Starve.io. 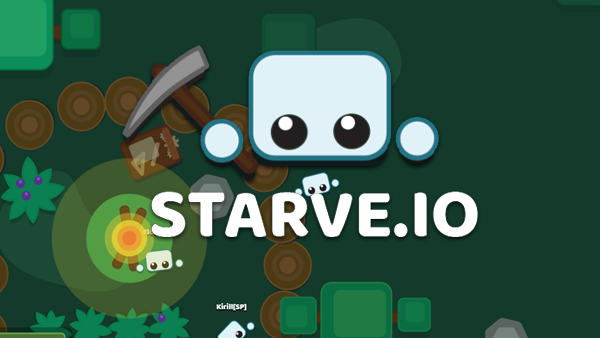 Starve.io or Starveio is a simple survival game. You start in a virtual world with nothing to your name, bar the ability to punch trees as a method for collecting wood. In doing so you are able to craft new items. Items such as a wooden pickaxe. The likes of which can be used to collect stone. With new resources like stone, you open up new crafting possibilities and thus new tools and items. It is up to you to craft the tools you need in order to stay alive. When you start playing you will see a health bar, hunger bar and cold (warmth) bar. Your goal is to not let them drop too low. If you do, you will die. Keeping the hunger bar full is relatively simple. The world is littered with berry bushes. You can hit them to collect berries. Clicking on the berries you collect makes your character eat and this satisfies your hunger. To keep your bar full, you probably want to avoid fighting other players and stay well clear of the foxes. Foxes will follow you and attack you. Players, however, can be a little harder to stay away from. We all know that a friendly helper can quickly turn around and kill you. Heck, it is a great way for people to earn points. And being a .io game, people want those points, so they can be number 1 on the leaderboard. Keeping warm is easy, albeit a little hard to figure out your first play. You can either build a campfire, which required wood. Or, you can find a player with a campfire. Huddle up close and hope he doesn’t kill you. After you play a few times, you will see how easy it is to craft a campfire and you won’t need to rely on hope and trust to live through the night. The game has some nice game mechanics and lots of items to craft. However, I won’t be sharing all the items in this post. The developer has deliberately left the player to explore the game and crafting and I wouldn’t want to spoil that for you. After playing this game for a while, I like it. I’m not a fan of the graphics, but that is just my personal tastes. I think this game will grow nicely and the .io gaming community already seems to love it. Maybe you will too.